The Summer Solstice is the longest day of the year in the northern hemisphere and marks the beginning of the summer. 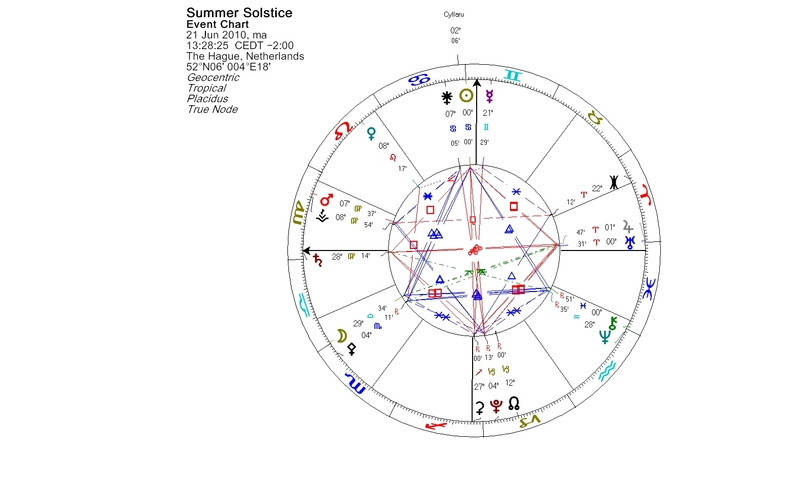 Last Monday the Sun reached the first point of Cancer and added the fourth cusp to the cosmic cross in the sky. An impressive grand cross was formed. In a grand cross pattern at least four planets in two oppositions are at square angles to each other, forming a cross shaped pattern. In the current cross Saturn in the late degrees of Virgo is opposing the Jupiter-Uranus conjunction on the Aries Point; the Cancer Sun is opposing Pluto in the early degrees of Capricorn and Ceres in late Sagittarius. Ceres was right at the Galactic Core on the solstice day. In pre-Christian times in Scandinavia the time of Midsummer was sacred to the Norse sun god Balder. Midsummer was known to be the anniversary of his death. His body was burned on a funeral pyre, and bonfires are still lit in Northern Europe for Midsummer eve celebrations. After the solstice the days soon begin to shorten and darkness will reign for a period of time. Balder descends into the underworld, but he will be reborn. Balder and his mother Frigg had ominous dreams of Balder’s death. Frigg made all things on earth vow never to harm her son. All objects made this vow except one little plant, the mistletoe, since Frigg had thought it too young to threaten Balder, she allowed the exception. After this the gods amused themselves by flinging darts and hurling objects at Balder, knowing that that they could not hurt him. But the trickster Loki had found out that the mistletoe had not taken the oath. Loki gave a twig of mistletoe to Hoder and persuaded him to throw it at Balder, secretly guiding Hoder’s hand. Balder fell dead to the ground, pierced by the twig. The gods were weeping for Balder. He was ceremonially burnt upon his own ship. His horse was also burned on the pyre. Balder’s wife Nanna was heartbroken and threw herself on the funeral fire. Then the burning ship was set to sea. Balder is said to return to life after Ragnarök. The Earth will appear again from the sea, it will be fertile, green, and cleansed of all its sufferings. The Norse myth of Baldur’s death reminds me of Greek Centaur Cyllarus. Even though the Centaurs were not gods but a bunch of troublemakers — except Chiron and Pholus, the two civilized centaurs — these two stories from two different cultures share some mutual characteristics. In Metamorphoses Ovid describes Cyllarus as a young, handsome Centaur with a golden mane. He was loved by many, but Cyllarus loved only Hylonome. They were inseparable in life and they died together, too. They were present at a wedding party, where fighting broke out and Cyllarus was hit by a javelin. Cyllarus died in the arms of his beloved. In her despair Hylonome killed herself by throwing herself onto the same spear that had pierced her partner. At the solstice, the Centaur planet Cyllarus was conjunct the Sun. Commitment, self-sacrifice, or feeling of falling the victim of someone or something are themes that may suddenly arise. Things may seem to happen to us for no reason. We need to be conscious of the decisions we make, because our actions always have consequences, not just for ourselves but for the people close to us. They may also affect on a larger scale the world around us. At present Chiron and Neptune are in trine to the Sun, and can offer us awareness, healing and compassion on the personal and collective level. The Full Moon takes place on Saturday. 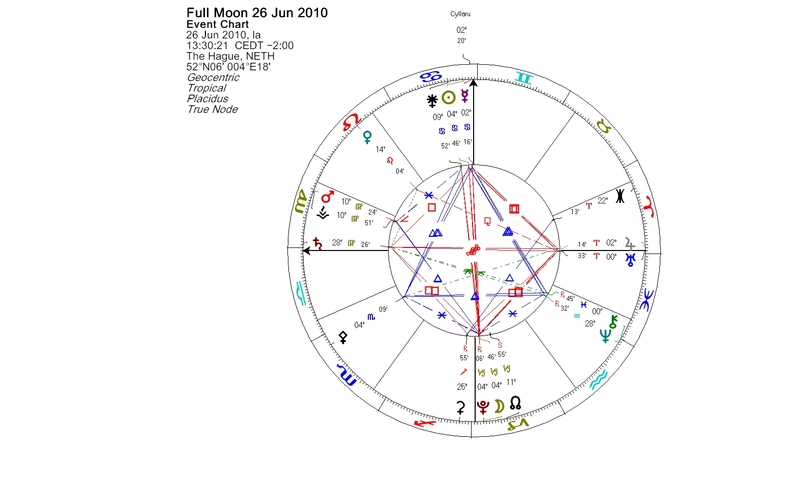 The Moon aligns opposite the Sun and takes part in the spectacular cardinal grand cross. We get to experience a partial lunar eclipse in conjunction with Pluto. We enter a transitional zone, where a shift from an old state to a new one takes place. By the time of the lunar eclipse, the Sun has passed Centaur planet Cyllarus. Mercury has just ingressed Cancer and now conjoins Cyllarus. We may feel the pressure, but please remember that the light will be eclipsed only for a brief moment. We are part of eternal cycle of the planets. There is always a new dawn after the dark hours. I want to wish you all a happy Midsummer Full Moon! This entry was posted on Friday, June 25th, 2010 at 9:17 am	and is filed under Eclipses, Full Moon, Solstices. You can follow any responses to this entry through the RSS 2.0 feed. You can leave a response, or trackback from your own site.